On 2/5, Razteria (Renee Asteria), Rahman Jamaal present their new single “CHANGE”. Also featuring Sol Atash from Empress Unification. CHANGE is available on digital platforms 1/22/16. 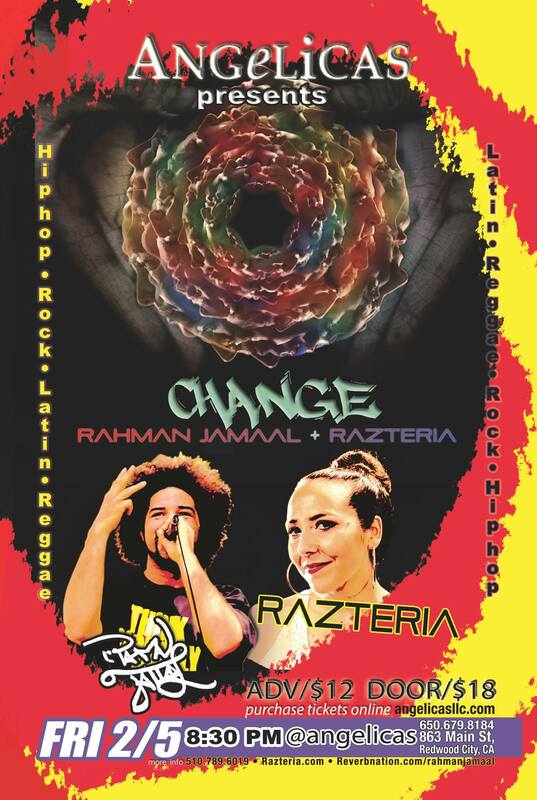 On the new single “CHANGE”, contrasting artists Rahman Jamaal & Razteria, fuse on this trilingual crossover track which calls for revolutionizing our mind-state without fear. Change is the only constant in Life. San Francisco based artist Razteria (aka Renee Asteria) can be described as a fusion of Bomba Estero, early No Doubt, Steel Pulse and Marissa Monte. Razteria unites simple yet intricate songs w/powerful messages through ethereal harmonies, passionate grooves & fat bass. “AVENTURERA” is the title track of Razteria’s new album coming Spring 2016. Over the past ten years, Razteria, performing under both Razteria and Renee Asteria, has planted musical seeds throughout the Americas (Argentina, Bolivia, Canada, and USA) and Europe (France, Switzerland). In late 2015 Razteria completed her fifth album Aventurera, which will be available as of March 18, 2016 on digital platforms worldwide and in select stores. Razteria has opened for and performed with Grammy award winning Reggae artist Michael Rose, popular UK/JA lover’s rock Lloyd Brown, The Garifuna Collective from Belize and others. Noteworthy performances include Reggae on the River, World One Festival, World Fest Los Angeles, Northwest World Reggae Festival and the Montreal Jazz festival, to name a few. Her music has been licensed by MTV’s True Life series as well as a few independent films. Razteria has also begun building a recording studio as an accessible and affordable space for aspiring artists.